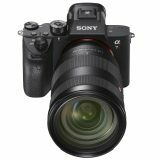 Sony Alpha A6000 – World’s fastest AF? I have camera only 2 days, and I didn’t have much time for testing: I did however brief preliminary test of that magic AF and I am – disappointed? First problem with World’s fastest AF camera that you might find is AF settings. Canon released some useful publications of how should you set AF system for different situations. Sony gives you electronic manual for a6000 that says virtually nothing (or very little) about AF functions and their interaction. Logic would tell that difference between last two is only in the pre-focus. At on, it should pre-focus on different targets, so when you press shutter speed you should save some time before focus lock. But if you actually follow behavior of tracking in both modes, it is quite different. While at AF lock-on, you can see multiple little focus squares, that are trying to stick with your subject, in the start w/shutter mode, you can see something like flexible spot with variable size and shape (green square that change its size). Important trick is that in lock-on mode you have to point camera so that your subject (that you want to keep tracking) is in the middle of the frame and than press “enter” button (middle part of the cursor control) to lock the focus. A square will appear and will try to track your subject being green when shutter button is half pressed and focus is acquired. But behavior of two modes stays somewhat different anyway, because AF lock-on stays regular square and same size, while AF lock-on start w/shutter adapt ithe focus area during tracking. Many things remains difficult to understand, especially when it comes to interaction of different settings, but at least some of the settings are better explained. But, let me start from the beginning – you got your camera, you want to go with your kid and dog to the park, and want to use the fastest AF system in the world to get lot of crispy keepers – right? There is simple solution for you – switch the camera in the “Scene” mode, select “Sport” and you are ready to go. There are however few serious limitations too – in this mode you can’t choose AF area. Selected AF area is Wide – and you should first be sure to lock focus on your subject and than hope that it will hold on before you manage to press the shutter. Also ISO is locked on Auto and you can’t change exposure settings. In this mode, camera seems to prefer aperture f/4, push the ISO quite high and as a result – acquire very fast shutter speeds. 1/2000s seems to be its sweet spot. As you can see, tracking was not really successful. Camera also set a very fast shutter speed (1/2000s) that wasn’t necessary for this action, but I wasn’t able to change it. As a result, ISO was also unnecessary high and Sony JPEG engine didn’t really help, so overall result is – disappointing.Positive is, that you can select RAW or RAW/Jpeg and see if you can get better noise reduction with external application. If you feel competent and experienced, as action shooter, you would certainly work in one of creative modes, and set all parameters to best meet your needs. This is what I tried in my second AF test. I selected S-mode (shutter priority) and set 1/250s, which is not quite enough, but I wanted to let some flexibility to increase DOF as much as possible with the anyway very slow lens SEL 55-210 f/4.5-6.3 OSS. I set Auto ISO, because in this mode, camera tends to keep ISO lower if possible. AF drive was set to C-AF, face detection to off, to let high speed drive to work on its best – 11f/s. As I was testing AF and didn’t expect any real keepers, for once I selected only JPEG fine and – large 24M size. I put the camera on tripod and asked Max to run toward it. That is one of the most challenging situation for the AF, and one that I was most curious to see results. You can look at original size files by clicking here. As you can see, camera was able to track Max for the first couple of frame, and than AF was lost and couldn’t hang with him. Camera tried hard, but didn’t succeed, being always somewhere close (not completely lost), but not quite there. As I said, 1/250s was not quite enough to freeze Max, but that shouldn’t affect AF – which you can see in most shots as being back or front focused (beside the motion blur). Max is very fast. On top of that he doesn’t have contrast colors on him – no red or pink or what we used to see in promotional videos. It wasn’t easy situation for camera, but it was far better from many situations that potential buyer will face – theatrical performance, soccer players with unpredictable moving, kids running in the living room etc. There was plenty of light in the right direction. I tried same AF settings with different focus area settings – wide focus and zone focus, but there were even less keepers. Wide area was complete disaster, while zone focus worked only when Max was close to camera. I even tried combination of zone focus and face detection without encouraging results. 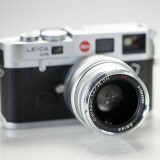 Finally, there is another big question related to the camera with fastest focus in the world – what lens to put on it? Maybe FE 70-200/4 and FE 24-70 f4, will focus faster than FE 55/1.8 and SEL 55/210 f/4.5-6.3, but both are rather slow lenses for sport and action, where even f/2.8 is sometimes on the edge. OSS in those situation, when fast shutter speed is needed won’t help. So when Sony claims – A6000 can focus at 0.06s, let me ask – on what, with which lens, and at which FL? I don’t want to blame this camera for AF yet, because it is still possible that I did something terribly wrong. I just wanted to send a fast message to those who are considering this camera because the world fastest AF – if you can, wait for more professional reviews, or try it for yourself. It won’t work magic out of the box, and you will need to spend quite some time trying to figure out, how to set it to get best results. Update is posted – here. Interesting test. I have the 55-210 as well and consider the a6000 because of the AF-system. But for a fast moving kid like this you would probably need a shutter speed of at least 1/500, don´t you think? That would crank up til iso a bit but not a problem for the sony mirrorless. Also AF normally need a little time to catch up, so maybe it would have been better with a couple of “warm-up”-shots. Would love to see some 1/1000 shots on iso 4-800 handheld. Thank you for all comments and sorry for the delay in reply. I agree and mentioned that 1/250s is too slow, but the test when he is running around with the dog is at much higher speed and it is even worse. Viktor, I totally forgot to commend you for your very interesting site. 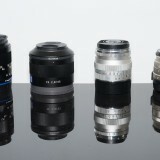 I´ll sure be back to study all the work you´ve done comparing excellent lenses. With regards to the 55-210 test: you may very well be right. It is a slow (but not bad at all and sharp at 210) lense, and of course you´ve already firmware-updated it, I guess? But sure would be happy to see another test. 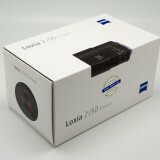 The very realiable Gordon Laing at Camerlabs just posted his review and it seems it is not the AF-system that´s faulted. 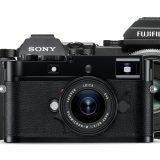 The AF-system is actually getting praised as if it was a costly DSLR and the successrate is way above (95 pct.) anything before it. Sweet music for a “bird-shooter” like myself – now we only need a zoom or tele that can keep up if in fact the 55-210 is too slow (Anonymous 1). I am glad you found few useful infos. Firmware of SEL 55210 was upgraded to .02 prior to the test. … and flexible spot, small spot (and “full focus” and panning skills on the part of the shooter) would maybe help. AF never does it all, not yet, that is. Btw: the facedetection seems to work great on this camera, so maybe you should try to switch it on (there are other rather impressive tests out there right now of facedetection AF in a6000). I’ve had similar problems with the a6000 and tracking. 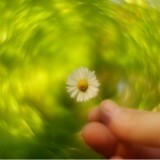 I’m finding using centre spot focus and tracking the subject myself – i.e. 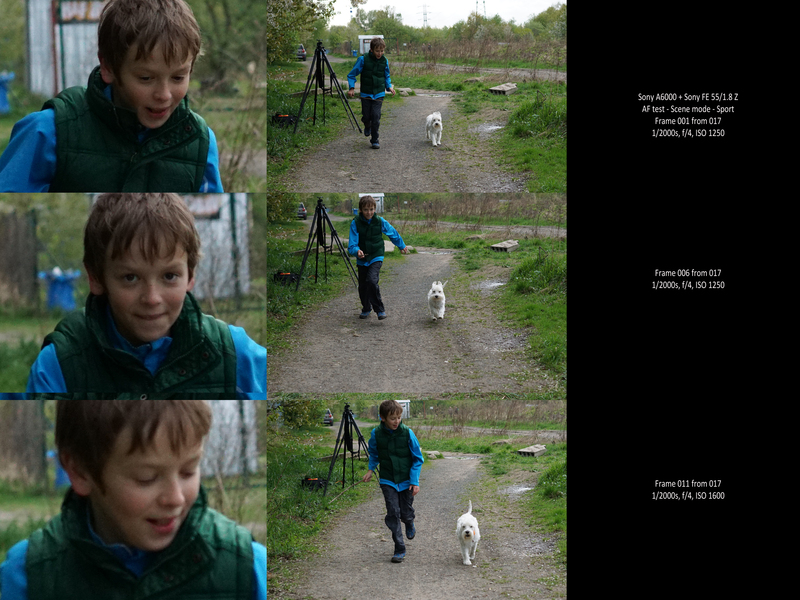 keeping it in the centre of the frame – is working better than the Sony tracking. Its certainly not as amazing as the Sony adverts suggest. Thank you for your input (I´m the Anonymous from the two first entries on this thread :)) Very nice to hear from someone who has a real “hands-on” knowledge of the a6000 and who isn´t biased. There are – strangely enough – not so many thorough tests out there yet despite the purposedly fantastic abilities of the a6000 AF-system. One would think that´s the ultimate test of mirrorless versus dslr: can the AF on mirrorless finally keep up? It would be so nice to see someone compare the AF-system with a say 70D (which maybe also have some problems according to some youtubers) I myself am using the Nex 5n and 5r. On the 5r I shoot burstmode, fleixible spot and spot meetering almost (AF and AF-C) all the time for fast moving objects (mainly birds) and shutterspeeds aorund 1/1000, and always try to keep object in center of the frame. That seems to be the only settings that will give a fair amount of good, sharp pictures. Actually it is quite allright, you can´t expect a 100 pct. successrate, but it can´t track approaching objects so I had hoped the a6000 would do the job. Maybe not. Yet. I agree with your results. 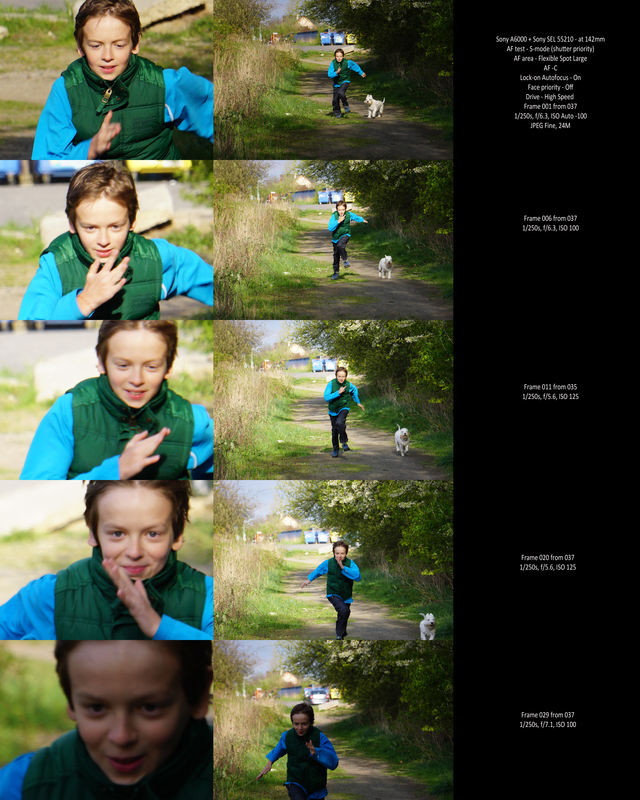 I did similar tests of my runnin children with A6000 burst mode and SEL 18-55mm (firmware updated for PDAF). My results were similar to yours: only the first 2-3 shots wer properly focused. 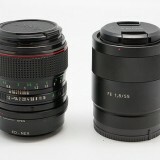 I even ordered the SEL 16-50mm because I thought my old kit lens was too slow! Did you test this lens too? I don’t have 16-50 PZ, nor I plan to buy it, but I might go with FE 70-200 f/4 OSS soon and will see if that one can give better results. I am seeing the same thing. Af-C , MEDIUM burst mode, 1/125, 50 f1.8 lens @ 1.8 and ISO 3200 – indoors. Had my child sit on the couch and rock her head front and back….Camera struggled ….May be I have not configured it correctly…. Could you test with the16-70mm F/4 lens if possible? I read some of your post and see that you have a lot experience with nex system. i have been use on sony alpha a550 for 2 years, my father in law give me. But, for some situations i don’t like of carry all that wheight from camera and lenses. So i’ll buy one a6000. my question is, have you any experience with sigma 30 2.8 and 60 2.8?? 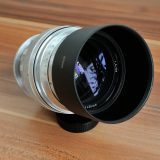 I would like to add this lens to de set or maybe change the 60mm to a sel50f18. If you can give me your opinion. Sigma 30/2.8 is a very sharp lens with solid contrast. Considering its price (I bought mine for 99 USD, but it is first version), it is probably best bang for the buck in E-mount lens world. For some reason however, I am not using it much. From the very personnel point of view, I find this Sigma to be somewhat too technical without pronounced character. But beside the built quality of the first version, where you will probably encounter problems with manual focusing (focus ring gets stiff after short use), there is little to say against this lens from the technical side. It could be faster, but than it would be also bigger, heavier and more expensive. It should serve as a nice standard FL, all purpose lens on your A6000. 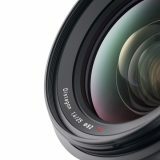 I have no experience with Sigma 60/2.8 but it is supposed to be sharpest APS-C lens made for E-mount. 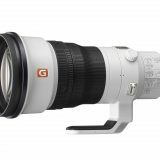 I have Sony SEL 50/1.8 OSS and would recommand this lens hands down. Really nice package with solid AF (on A6000 with recent firmware), pleasing bokeh in most situation, sharp enough wide open and excellent from f/2.8, stabilization, solid build quality but moderate size and very light, decent speed and reasonable price. If there is something that I would like to be slightly better it would be micro-contrast and slightly warmer colors. 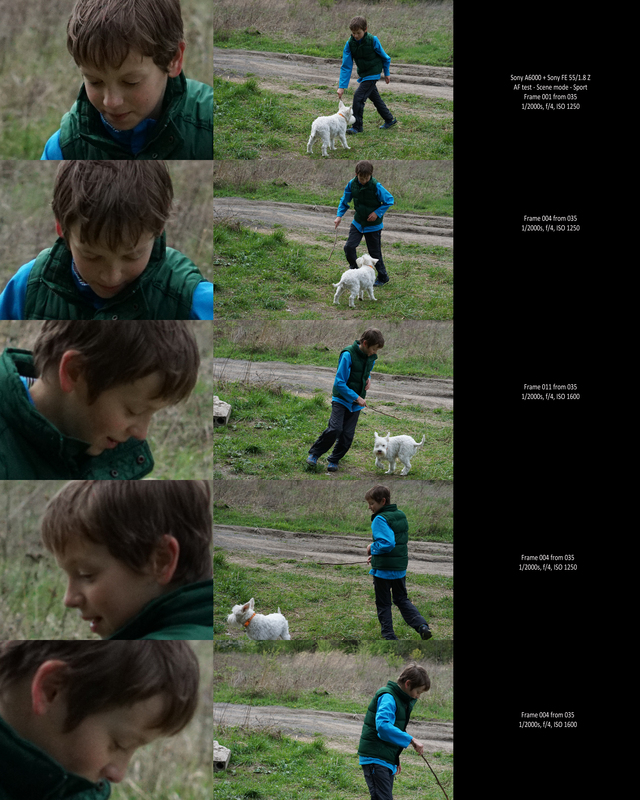 On my blog you should be able to find short test of Minolta Rokinon 135/2.8 MC, but MD should be better. I have no experience with A mount 135/2.8, but I have 135/1.8 Zeiss and 135/2.8(T4.5) STF and both are outstanding lenses. Samyang/Rokinon 85/1.4 is great lens for the price too and I am also curious to try Samyang 10mm. Nice and competent test. Could you try the samsung nx1, to see if it’s best/worse? we are waiting for NX1 test sample to come to our hands, but since we are based in a rather small EU country, we’ll have to wait a bit longer I am afraid.